InvestorCentric: Could Legalizing Marijuana Help Solve California's Budget Problems? Could Legalizing Marijuana Help Solve California's Budget Problems? The budget problems in California are well known across the nation, but one desperate idea to help balance the budget is sure to meet opposition from the rest of the country. California's governor, Arnold Schwarzenegger, has apparently requested a full debate on the legalization of marijuana. The benefit — of course — to California if marijuana is legalized is that they can tax sales of the substance. According to a recent public opinion poll of California voters, a majority favor legalization of marijuana. Perhaps citizens feel that compared to the other budget cuts — and new taxes — on the table to shrink the deficit, legalizing marijuana might not be so bad. For more on the situation in California, read the following blog post from Tim Iacono. 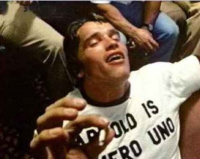 Arnold Schwarzenegger has never apologized for smoking pot – and loving it — at the height of his bodybuilding career in the 1970s. Now, as a struggling Republican governor of California reaching a crossroads in his political career, he might yet become America's most visible advocate for legalizing marijuana. The actor-turned-politician gladdened the heart of every joint-roller and dope fiend across the Golden State earlier this week when he said it was time for a full debate on legalization. Schwarzenegger was careful not to say too much – he stopped short of saying he was in favor of legalizing cannabis now – but his words broke a long-standing taboo among both Republicans and Democrats who have previously felt obliged to say marijuana must remain illegal, and marijuana users and pushers be subject to criminal prosecution. The governor spoke in response to a new public opinion poll showing that 56% of registered voters in California favor legalizing and taxing marijuana – in part to help the state out of the worst budget crisis in its history. Legalize it and treat it like alcohol - plain and simple. After 6 months of being legal, the same people who smoke, will smoke. The people who don't won't. And I'm so sick of the Gateway Drug Argument. Alcohol is the ultimate gateway drug. It's most people's first buzz. And if they like it, they want more. All of my successful friends that smoke never got into coke or crack. I agree the gateway argument is just wrong. If there's any reason that people who smoke pot get into other drugs, beyond the small percentage who just want to try everything, it's their dealers want to move them from something relatively benign, cheap, and easy to put down, to something that's more expensive (i.e. higher profits), more addicting (keeps you coming back), and shorter term highs (so you have to buy more often). Crack, meth, and heroin all fit that bill perfectly. If you sold pot in licensed stores, you'd immediately see a huge decrease in violent crime, and in the number of people using the three "bad" drugs mentioned above. and many of them are taking 15 pills simultaneously. One of the reasons why pills are becoming so widely used is because they're so accessibile. Just go to the medicine cabinet. If marijuana is legalized, people who wouldn't otherwise try it will do so because it, too, will be more accessible and there won't be any legal repercussions. And there are plenty of people who move on to other drugs. I did drugs for years - including, and starting with, marijuana - and have also been involved in drug treatment for even more years. I've known hundreds of people who started with marijuana and went on to other drugs. I would like to see Alec Baldwin's viewpoint polled so we can find out how many of those who think marijuana should be legalized already smoke it. Let's see some demographics on the people who are voting yay or nay. And let's see their reasoning. Are they in favor because it will help solve budgetary problems? Are they in favor because they've become completely apathetic about fighting it? Or do they truly believe it's okay for people to be drugged? I am a 65 year old woman. The only reason I don't smoke pot is because it is illegal. I think about smoking it everyday-very well knowing it would make my arthritic pain more tolerable. I don't take the prescription drugs that my doctor prescribes because of the side effects. I want my freedoms to include pot. I want it legalized before I die of old age. I have never heard anyone comment on how we can protect our youth by legalizing pot. First, they will not be associating with gangsters to make their purchases. Secondly, the quality of the pot will be regulated, insuring that dangerous drugs have not been added to the weed. Thirdly, legalized vendors won't be allowed to sell pot to them. I encouraged my children, as teenagers, to smoke pot and stay away from drinking and others drugs. My goal was to get them into adulthood alive. From their late teens until their early twenties they did try other drugs. Then they wanted to have families and be more a part of our society and realized the wisdom of dad's advice. Having a few friends die or end up with long-term jail sentences because of meth or popping pills with alcohol has a sobering effect also. Too many resources in terms of lost productivity, prison costs, and crime prevention is wasted on marijuana, a historically beneficial plant for humanity. We are a healthy, vibrant, community-contributing family of 2+3+3 with strong moral values. It is wrong to be so critical of pot smokers while sanctifying the bad behavior of cigarette smokers, alcoholics, and pharmaceutical abusers. If you separate marijuana from controled substances like it should be then it would not be as likely to be a gateway to the dangerous drugs. Alot of people start using the bad ones because they can not get marijuana. It would be great to regulate the quality. We would get our kids away from the street dealers that are the ones that intice them to use other drugs. The de-illegalization of marijuana was based on lies.